This is a fabulous ice cream with a wonderful texture and flavor. 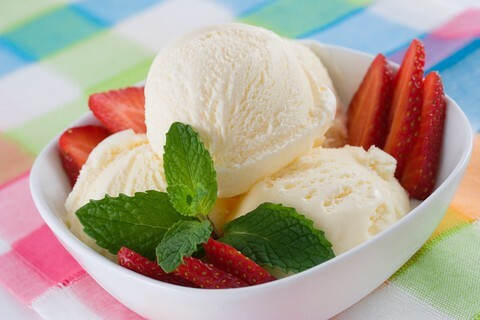 Talking about flavor, you can make any of the variations with this basic vanilla ice cream. Mine actually remained scoopable from the freezer for a few days. Delicious! Try it and you won't be sorry. To use up the egg whites make my Cream Cheese Scrambled Eggs - Just add a couple more eggs to the whites and follow the recipe but make it a bigger recipe obviously. Use the cream found in cartons that sit on the shelf - I believe this makes the ice cream scoopable - therefore, no need for adding glycerin or alcohol. In large saucepan, over medium heat, heat whipping cream and half and half until it is very hot but not boiling. Stir often. Remove from heat. In food processor, process egg yolks, liquid sweetener and erythritol really well. Gradually add warm cream mixture, while processing, until combined. Return egg mixture to saucepan and cook over medium-low heat until very hot, stirring constantly. Do not boil; watch carefully. Transfer custard to large bowl. Stir in whipping cream, vanilla and salt. Cover and chill in refrigerator overnight or at least 8 hours. Place in ice cream maker and follow manufacturer’s directions. Watch as the ice cream custard expands while freezing and could overflow. Place ice cream in freezer to further harden. Strawberry Ice Cream: Use 1 cup (250 mL) frozen unsweetened strawberries, slightly thawed. In blender, blend strawberries with custard, adding a little red food coloring, if desired, and use 1 tsp (5 mL) vanilla extract. Cappuccino Ice Cream: Use 1 tbsp (15 mL) instant coffee dissolved in 2 tbsp (30 mL) hot whipping cream and reduce vanilla extract to 1 tsp (5 mL).